Photographs taken with my mobile phone documenting the performance And Fight with Wura-Natasha Ogunji & Mary Okon Ononokpono. 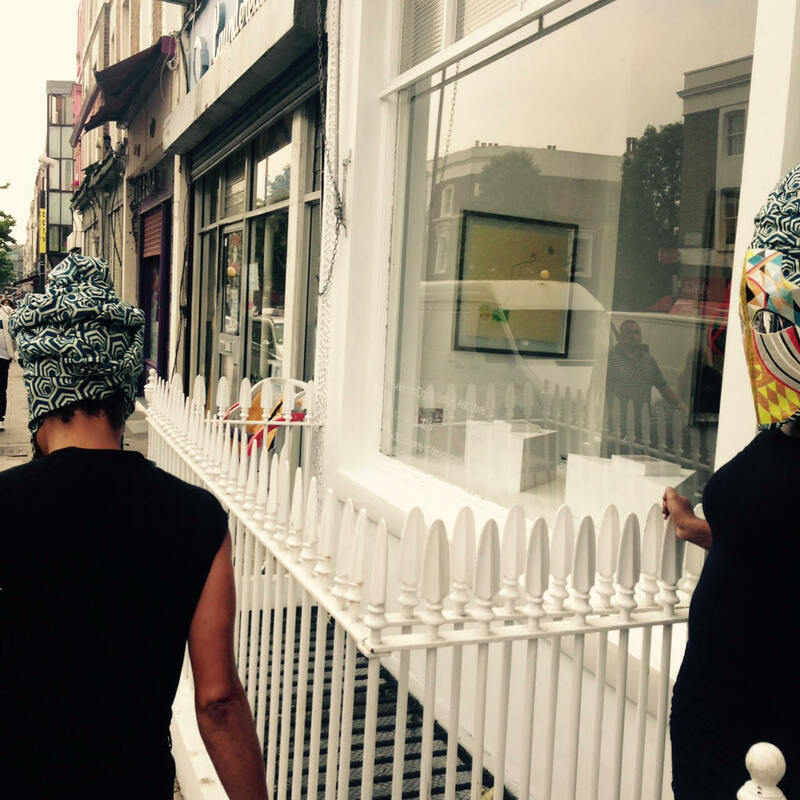 The performance, which took place on Friday 12 June 2015 at 5pm, was part of the exhibition Wura-Natasha Ogunji: Statues Also Love at 50 Golborne, London, curated by Erin Gilbert. The exhibition closed 18 July 2015. The performance was followed by a conversation with Erin Gilbert, Wura-Natasha Ogunji and Mary Ononokpono, selections are transcribed, edited and inserted here. 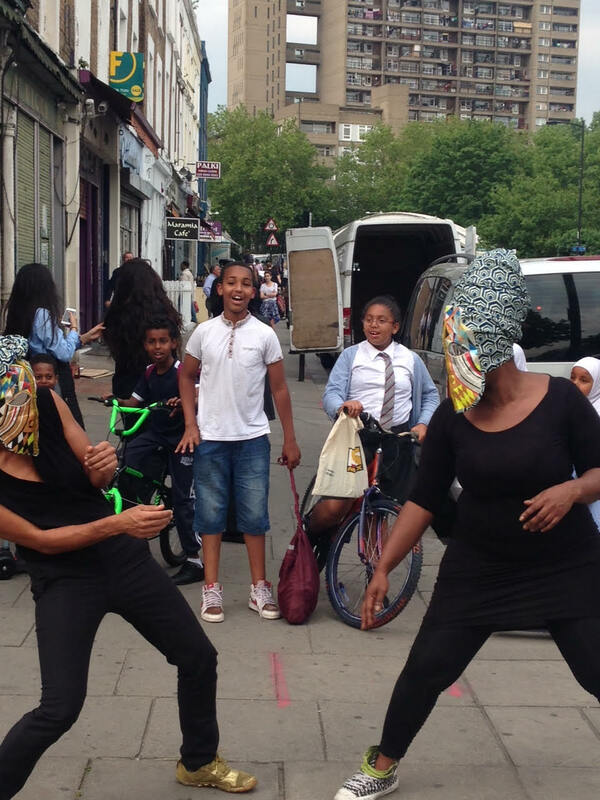 The performance And Fight was exciting to watch because of the way it activated public space, and drew passers-by who engaged with it in all kinds of ways, including the curiosity and banter of passing school children. There was an instance of vocalised anger from a man seated at a restaurant table on the pavement. The relationship of the work to passers-by and potential audiences, the risks attached to performing in public space, is important to its significance, its politics. The historic Trellick Tower, designed by Ernö Goldfinger, loomed in the background and contrasted with the more intimate, innocuous spaces of the pavement and its architecture of shops, gallery and restaurants. 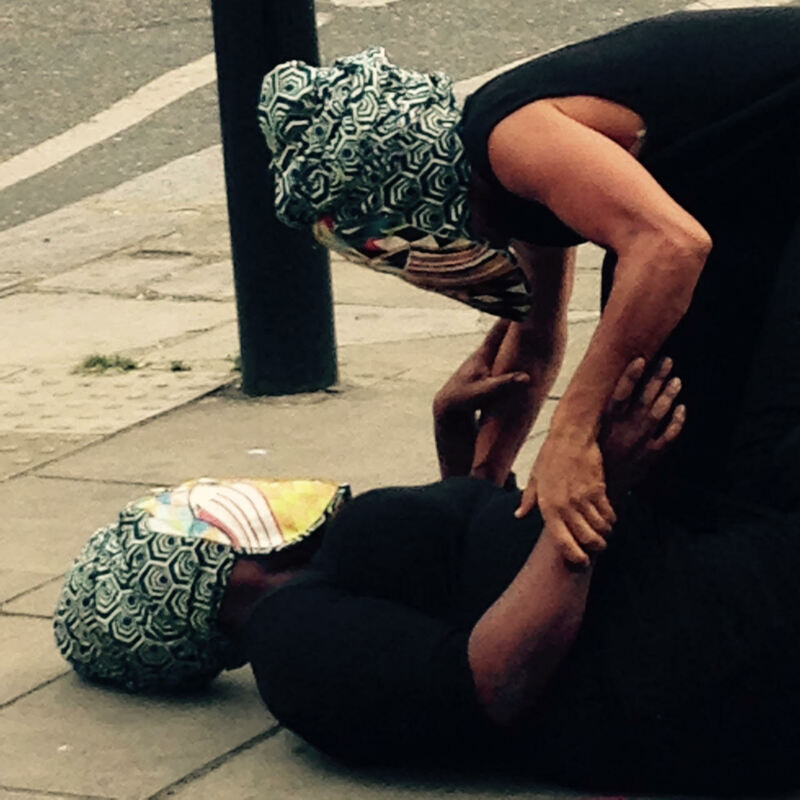 The physicality and the affective-psychic charge of the performance was really interesting, as the performers, two women, staged fighting and loving, using their bodies and the particular urban environment and architecture of Golborne Road. The performance can also be seen in relation to Ogunji’s earlier exploration of women, performance, and public space in Nigeria: Will I still carry water when I am a dead woman? (2011). 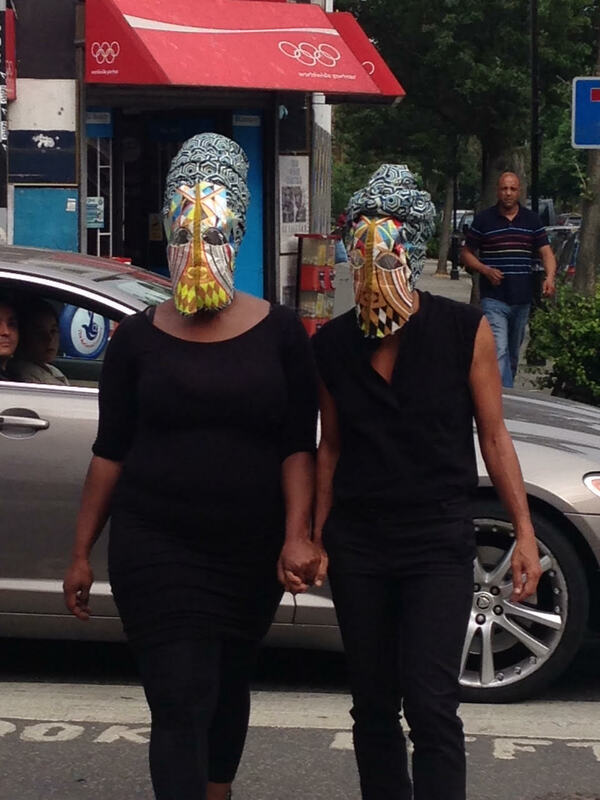 The mask emerges as a recurring motif, and invites us to imagine multiple narratives, which locate it within the specificity of Nigeria, its historical significations within this context, and its circulation historically, socially and politically across time, across history and geography. And Fight was inspired by a drawing that Ruby Amanze made. In this drawing a woman was kissing a mask. 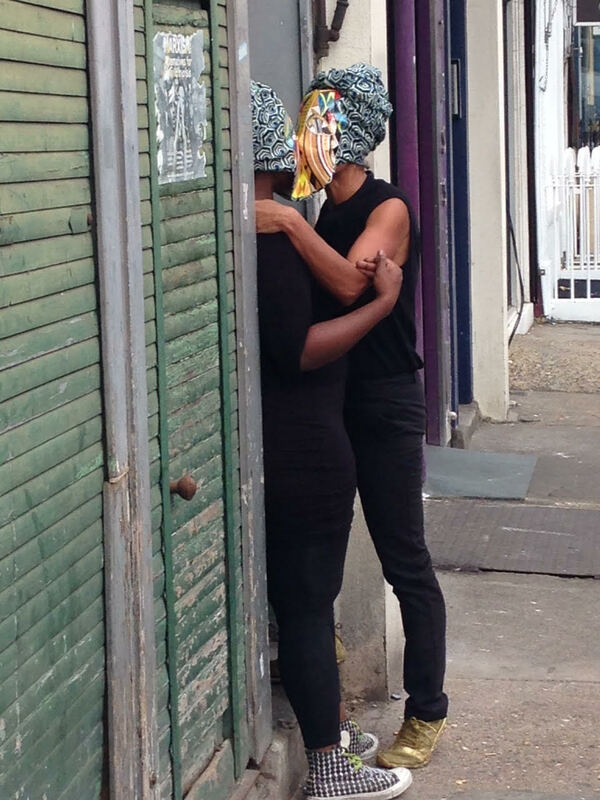 And part of the title says: “Who are you kissing, when you kiss a mask?” (Wura-Natasha Ogunji, in conversation with Erin Gilbert). 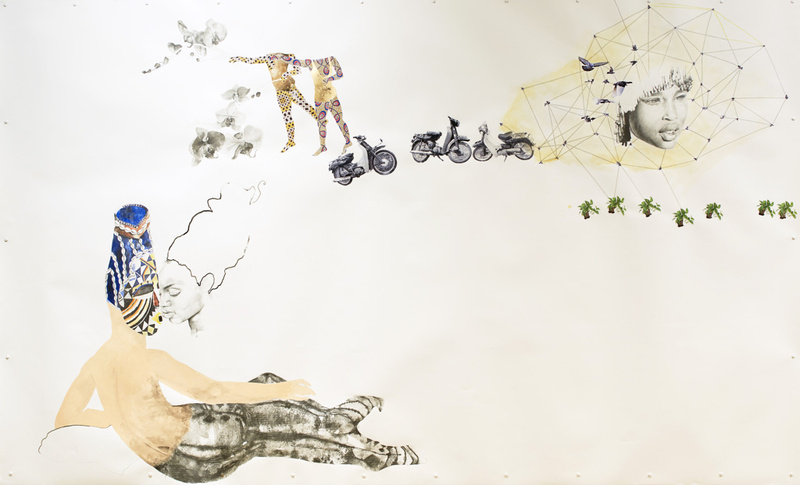 Ruby Onyinyechi Amanze, “that low hanging kind of sun, the one that lingers two feet above your head, (never dying) house plants in exchange for your freedom …orchids in exchange for your love, who are you kissing, when you kiss a mask?”, 2015, Photo transfers, collage ink, metallic pigment, graphite, colored pencils. Courtesy Ruby Onyinyechi Amanze. 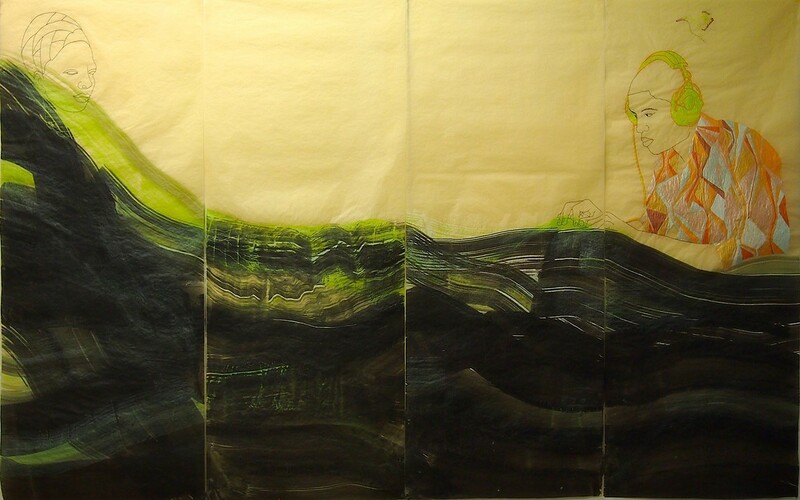 Wura-Natasha Ogunji, 2015, “Sound Man and The Sea”, 2015, Thread, ink, graphite on paper, 4 panels. Erin Gilbert: In this exhibition, “Statues Also Love”, you see works on paper, a large part of Wura’s practice, and also a video and the performance. There are three elements of her practice that are activated within this particular space […] In all of the works you see land, you see water, spaces that reference the Atlantic, the idea of traversing the ocean. In this sense, there is an ongoing conversation with America and Africa, specifically Nigeria because Wura’s father is from Nigeria. Lagos is a point of reference. Wura-Natasha Ogunji: My father is Nigerian but I didn’t grow up there. My first trip was only about four years ago and I went to Lagos. I was invited to do a performance piece, and this gave life to the performances that explore the presence of women in public space. The first performance was inspired by household work at the home of my family in Lagos. I thought about the act of carrying water from a water tank, work done largely by women, and I had this question: “Will I still carry water when I am a dead woman?” In my first performance piece I tied water kegs to my ankles and crawled through the street in Lagos. 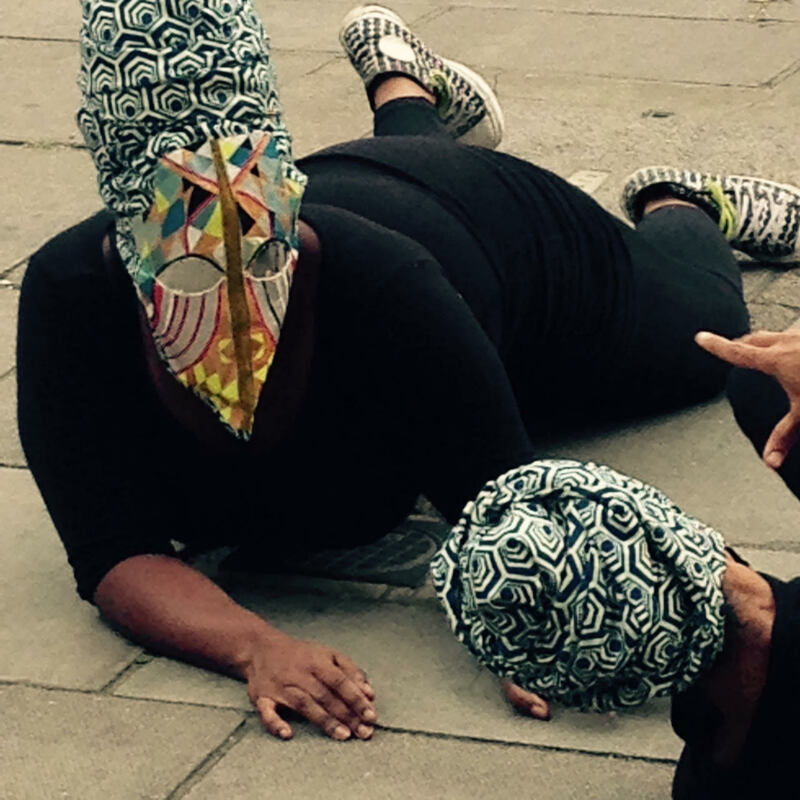 This performance gave rise to other performances and drawings that are about the presence of women in public space; and also about the moments of intimacy and connection that happen in the intense pressure of these urban spaces. I did the performance again at a later date because I wanted to do it with a group of women: there were about 10 or 12 of us in the end. We walked the streets with these water carriers for a couple of hours. Before I went to Lagos I had this question, which I explore through video work: “Do my ancestors in Nigeria long for their ancestors in America?” In the videos I take on the persona of an Ife head and I fly across these expanses of land. I was thinking how would an ancestor get from Africa to the Americas. They can either walk on water or they could fly. I made videos where it looks like I’m walking on water or flying (I’m just jumping up in the air, and then I edit). There is an awkward flying motion. For me that question was really connected to my own questions about whether I have something creative to say when I get to Nigeria. And does anyone really care about what I have to say creatively? I was visiting Nigeria for the first time. Although I do have a connection to Nigeria I felt as though I didn’t have the language or the right to talk about this issue. For me, the use of the mask is about an in-between space, a liminal space. It is the space of the Atlantic in a way. It is a space that is solid and historical, and physical. But it’s also metaphysical. It’s also a metaphor. In Nigeria the mask is used to invoke something or allow something to enter a space that isn’t always there. I am really interested in what the mask allows, and the spiritual and narrative and creative space that happens with the mask on. I am interested in how this allows a certain political and social power in the world. 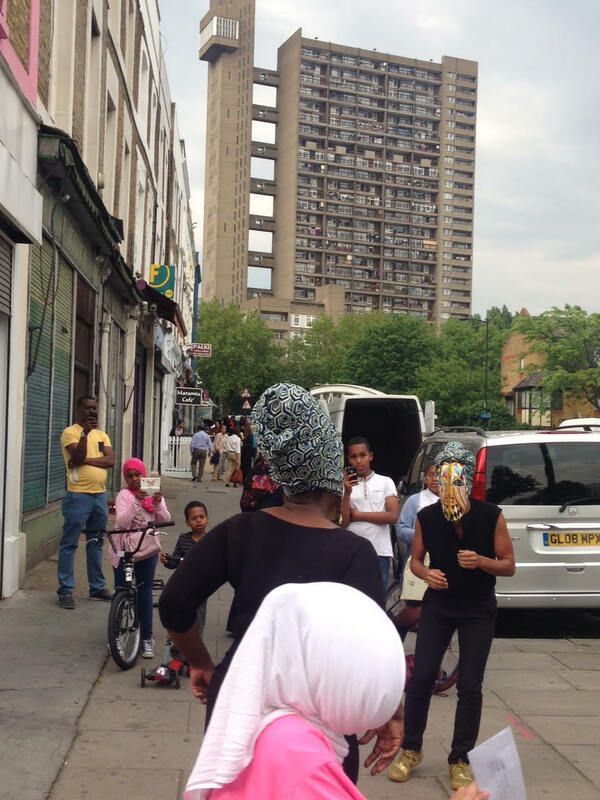 And Fight, Golborne Road, London, Friday 12 June 2015. 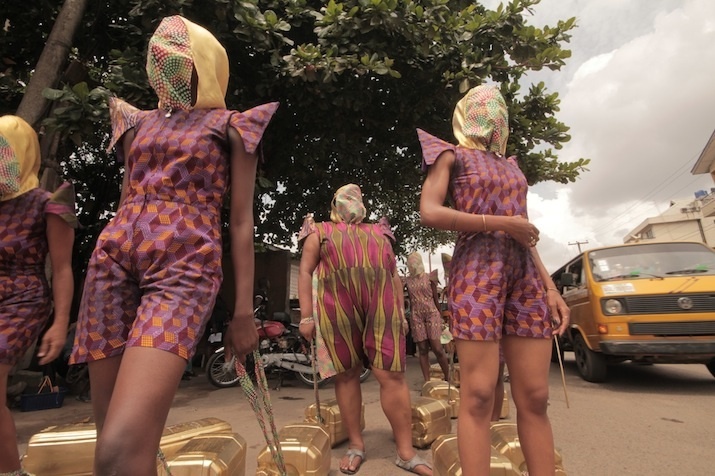 This entry was posted in Documenting Performance Art and tagged Affect, Architecture, Nigeria, Performance, Public Space, Urban Environments, women and history, Women Artists, Wura-Natasha Ogunji. Bookmark the permalink.